Suppliers of direct drive tube axial fans, inline direct drive fans, in line direct drive ventialtors, in-line direct drive blowers, axial inlinefans, axial flow fans, airfoil axial impellers, airfoil fans, industrial direct drive fans, direct drive axial fans, adjustable pitch impellesr, adjustable pitch fan propellers, adjustable pitch fan blades. 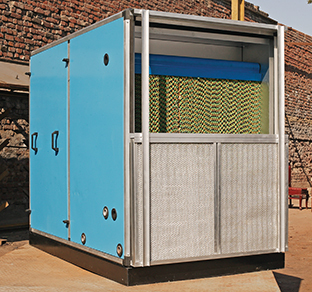 Custom built packaged air handling units with capacities from 2,000 CFM to 100,000 CFM are available in various models. The design incorporates important components such as air filter section, pleanum fan module and direct / indirect gas fired heating system. The AHU units requires very little maintenance and low installation cost. Supply of air blast blowoff systems, abrasive dust pressure blowers, air drying ventilators, industrial air polution control equipment, indoor air quality control ventilation systems for industry, boiler pressure blowers, industrial burnes fans and blowers, bulk handling vacuum blowers, chemical and industrial waste management air systems, air fan classifiers, smoke & mist exhaust fans / blowers, industrial vacuum blowers, air conveyor pressure blowers. Axial flow fans are commonly used in commercial applications. Fiberglass axial flow fans are finding greater adoption in industrial applications as an alternative to centrifugal equipment, which is more expensive. FRP fiberglass blowers and fans, acid resistant PVC and Propylene New York Blower fans, blowers, ventilators. Industrial corrosion resistant FRP and PVC fans and ventilators, commercial ventilation equipment, pressure blowers, high temperature oven fans, centrifugal and axial ventilators. We offer custom engineered solutions, packaged fans, blowers, ventilators and customized industrial process ventilating equipment.